The Monarch Plasmid Miniprep Kit is a rapid and reliable method for the purification of up to 20 μg of high quality plasmid DNA. The Monarch Plasmid Miniprep Kit is a rapid and reliable method for the purification of high quality plasmid DNA. This method employs standard cell resuspension, alkaline lysis, and neutralization steps, with the additional benefit of color indicators at certain steps to easily monitor completion. Unique wash buffers ensure salts, proteins, RNA and other cellular components are removed, allowing low-volume elution of concentrated, highly pure DNA. Protocols are fast and user friendly, saving you valuable time. Elution in as little as 30 μl provides concentrated DNA for use in downstream applications, such as restriction digests, DNA sequencing, PCR and other enzymatic manipulations. Designed with sustainability in mind, Monarch kits use significantly less plastic and responsibly-sourced, recyclable packaging. strain, culture volume, and growth conditions. Preps were performed according to recommended protocols using 1.5 ml aliquots of the same overnight culture. One microliter of each prep was digested with HindIII-HF (NEB #R3104) to linearize the vector and the digests were resolved on a 1% w/v agarose gel. 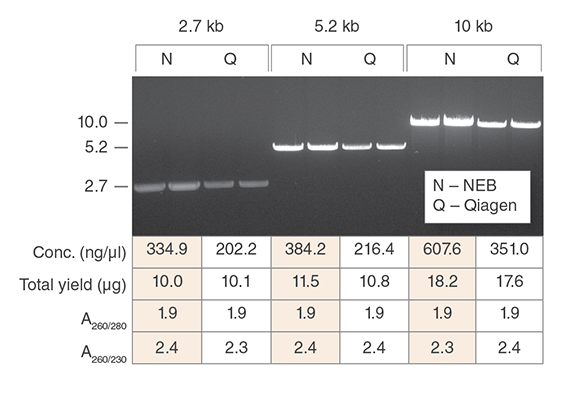 DNA from Monarch Plasmid Miniprep Kit is reproducibly compatible with DNA sequencing. Plasmid DNA from three separate preps was sequenced using BigDye® Terminator chemistry on an Applied Biosystems 3730XL DNA Analyzer. The electropherograms demonstrate the quality of the DNA is reproducible. The kit should be stored at room temperature. Always keep buffer bottles tightly closed and keep columns sealed in the enclosed zip-lock bag. After Plasmid Neutralization Buffer (B3) is opened, it should be stored at 4°C. For information regarding the composition of buffers, please consult the Safety Data Sheets. Proper laboratory safety practices should be employed, including the use of lab coats, gloves, and eye protection. I am seeing RNA in my miniprep DNA. How can I avoid this? What is the composition of each buffer provided with the Monarch Plasmid Miniprep Kit? Why do I see a smear above my plasmid band on an agarose gel? What are the additional bands I see on the gel? Do the dyes in the buffer present any issues for downstream applications? Reagents added incorrectly. Check protocol to ensure buffers were added in the correct order and that the sample is bound, washed and eluted in the correct sequence. Plasmid lost during growth of culture. Ensure proper antibiotic is used at correct concentration in order to maintain selection during growth. Do not sub-culture amplicillin-maintained cultures to avoid depletion of antibiotic by secreted β-lactamase. Use a fresh plate and avoid selecting satellite colonies when innoculating the culture. Incomplete lysis. Ensure cell pellet is completely resuspended before addition of Plasmid Lysis Buffer (B2) and that color changes from light pink to dark pink. Take care to not use too many cells. If culture volume used is larger than recommended, scale-up buffers B1-B3 to ensure proper processing of the sample. Plasmid loss during growth, see previous section. Low-copy plasmid selected. Increase amount of cells processed and scale buffers accordingly. Lysis of cells during growth. Harvest culture during transition from logarithmic growth to stationary phase (typically 12–16 hrs for growth of cultures in LB) to avoid lysis of cells common during extended periods of cell growth. Incomplete neutralization. The sample tube should be inverted a sufficient number of times to produce a complete color change to yellow. Cell debris will appear in abundance. Nothing should be floating on the surface after centrifugation, but rather should be compacted into a pellet. Incomplete elution. Larger elution volumes and longer incubation times can increase yield of DNA off the column, at the cost of dilution of the sample and increased processing times. For typical plasmids in the 3–10 kb range, the recommended elution volumes and incubation times are sufficient. For the purification of larger plasmids, heating the DNA Elution Buffer to 50°C prior to eluting and extending the incubation time after buffer addition to 5 minutes can improve yield. Plasmid is degraded. Some E. coli strains (HB101 and the JM series) have high levels of endogenous endonuclease. Avoid using these when possible. If these strains are used, keep samples on ice during prep and ensure the Plasmid Wash Buffer 1 step is performed. Plasmid is denatured. Using Plasmid Lysis Buffer (B2) introduces sodium hydroxide to the DNA. Extended incubation in the presence of sodium hydroxide can separate the strands, or denature the plasmid. Adhere to the protocol and ensure this step is completed within 2 minutes and promptly move on to the neutralization step. Plasmid is contaminated with genomic DNA. Vigorous mixing after cell lysis and before pelleting of cell debris may cause shearing of the host cell chromosomal DNA and should be avoided. Additions of Plasmid Lysis Buffer (B2) and Plasmid Neutralization Buffer (B3) should be followed by careful inversion mixing. Do not vortex. Improper storage. Ensure DNA is eluted in DNA Elution Buffer or nuclease-free water to maintain integrity and store at –20°C. DNA should not be stored in solutions containing magnesium. Ethanol has been carried-over. Ensure final wash spin time is 1 minute to enable complete removal of the wash buffer from the column. Use care when transferring column to a new tube for the elution step to ensure column tip does not contact column flow-through. If there is any doubt, re-spin the column for 1 minute. Excessive salt in sample. 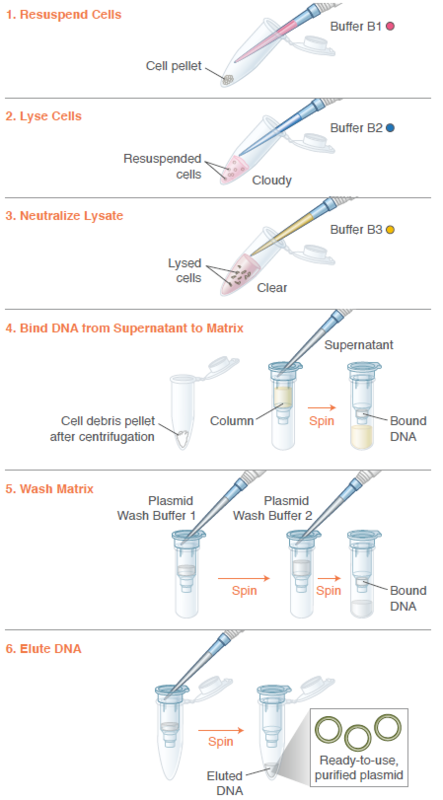 Ensure both Plasmid Wash buffers have been utilized according to the protocol. Unlike other commercial kits, all wash steps in the Monarch Plasmid DNA Miniprep Kit protocol are required. All steps should be performed as described to ensure the recovery of high-quality plasmid DNA. Excessive carbohydrate carried over. 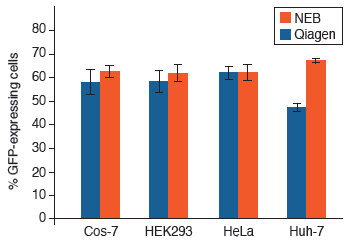 Similar to the endogenous nucleases, strains like HB101 and the JM series, have high amounts of endogenous carbohydrate that can interfere with downstream enzymatic manipulations of plasmid DNA. Be sure to follow the protocol and make sure the Plasmid Wash Buffer 1 step is included.